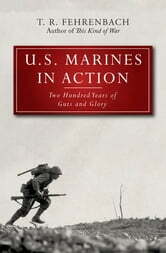 Ten major wars and two hundred minor actions comprise the history of the United States Marine Corps, and parallel the history of America itself. U.S. Marines in Action provides a comprehensive and stirring account of the activities of the military corps that has become synonymous with guts and glory. Fehrenbach dramatizes the incredible heroism of the leathernecks over two centuries of peacekeeping missions in every corner of the globe.